Have you or any of your clients ever had their AdSense accounts banned because of invalid traffic or fake clicks? I sure have, and I hate to admit but for years there was nothing that I could do about it. That’s the scariest part! My AdSense account getting banned was devastating and almost bankrupted my company. For those of us running traffic arbitrage or buying traffic, it is scary to rack up credit cards while waiting for our net 30 - 90 payments. Making the cash flow work is difficult, not receiving your largest payment is certain death. The worst thing was that I was not cheating the system, heck I did NOT even once click on my own ads on my site...ever! I navigated around my website like I was walking on eggshells. It was either some organic level of bot traffic that spiked on my site, a bad traffic source(s) or a rogue competitor who decided to buy fake traffic with the goal of eliminating me as a competitor. If the latter was true, they were sadly successful. In order for you to learn how to prevent yourself from such a risky threat, I am going to show you how easy it is for your competitors to get your AdSense account banned. I absolutely do not recommend or condone this in anyway, but am passing on common knowledge from blackhat communities. Why Would Google Ban your Adsense Account? Google's responsibility is to protect their Adword advertisers from fake and inflated costs due to invalid traffic and fraudulent clicks. This is how Google make tens of billions of dollars a year in advertising, and can not have fake traffic devalue their core offering. Unfortunately for website owners (publishers), Google may not be able to tell who is clicking on your ads for sure, but the owner is the one who gets punished when there is a spike in suspect traffic on your site. If this happens, Google will revoke all your unpaid ad revenues and will refund (revenue related to what they determine as invalid traffic) the affected advertisers. As we mentioned, you can pretty much say goodbye to those revoked revenues even if you try to appeal since it’s the worst AdSense violation. All of this is in Google T&C as they state that it is up to the publishers to monitor their websites for any large increases in revenue or visitors to make sure the increase didn’t come from invalid traffic. This includes monitoring all traffic sources and block them in case they are showing suspicious stats. Any invalid events on ads generated by a bot will get your competitor in trouble fast including automated program through clicks, impressions, queries or conversions,. 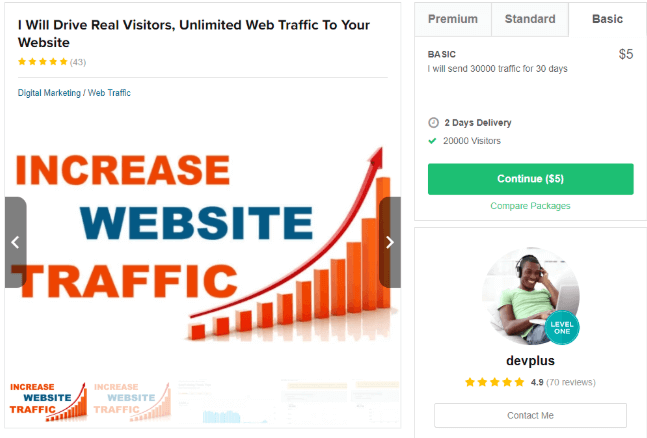 With a quick search on Fiverr I saw a profile from Devplus who will send 30,000 sessions to their website for 30 days for only $5. I am not saying that everyone on the internet is trying to scam each other, but sending tens of thousands of traffic (daily) to your website for only $5, is undoubtedly invalid traffic and therefore against AdSense T&C’s. I have heard of stories of people clicking on their competitors ads hundreds of times a day for months. It is commonly referred to as “Click Bombing” and if your competitor does not have the time to do this themselves, a quick search on Fiverr will discover many freelancers who would be willing to click on 100 times on someones ad for $5. The majority of these click farms are based in developing countries (like India and Bangladesh) where someone may only be paid a few hundred dollars a year. Many of these click farms do not advertise direct that they will click on your competitors ads, but it is well known that they do. Oftentimes they are used to increase engagement on social media accounts by sharing or liking videos, leaving comments, or whatever you pay them to do. According to Clicksease, It is estimated that 40% of all activity on the internet is bots or fake traffic. Many of these bots are created with good intentions (like search engines) to scrape information on your site to index it correctly. However, there are many bad bots that have been designed with the sole purpose to click on thousands of ads to deplete advertisers budgets. This is common with Adwords as bots crawl the web for specific terms in more competitive industries. Another quick search in Google for the terms “Auto Click Bots” shows hundreds of mostly free solutions, that will give them the software for their mouse to auto click on your ads. If they do not have the skills to set up one of these auto click bots, I am positive they can hire someone on Fiverr to do this as well for $5. The first step to reducing invalid traffic, is always be aware and understand your traffic. Any massive spikes in earnings, traffic, or irregular events is something that you will need to pay close attention too. This is something that is easier said than done. When I was banned, my account went from a standard click through rate of around 0.2% to nearly 1.5% in a day. I was too naive to think that something was wrong. About 2 days later, Google punished me in a big way. After I received an email about the invalid traffic violation, I couldn’t log into my AdSense and never received a payment again. Never click on your own ads - This is obvious, but when navigating or working on your website be extra careful to NEVER click on it. Double check your Adsense implementation making sure that the placements don’t encourage accidental clicks. Make sure to implement ads.txt with at least your AdSense credentials. If you have or add any other ad networks, add their credentials as well. Keep your ads.txt file updated and make sure to not have extra lines of credentials because that could leave you open to fraud. Be careful which traffic sources you purchase from. If the clicks are too cheap, it could be that all the traffic or a percentage is non-human traffic (NHT). Also monitor traffic spikes from organic sources. These could also contain high levels of NHT. Not violating webmasters policy guidelines from pornographic, copyrighted, illegal, or duplicate content. You may not be able to stop 100% of invalid traffic coming to your site to ensure your Adsense account does not get banned, but you can greatly decrease the risk. Human click fraud is the rarest and only shows up in small numbers. This could be in the form of you or someone in your company clicking on ads or enemies (eg. Ex-girlfriend, sports rival, Boogeyman) going to town on your ad inventory. All kidding aside, human click fraud has its limits in volume so if you’re running a site with over 100k page views, that shouldn’t be a large enough spike to risk your AdSense account. That brings us to the real risk, bot traffic. The only real way to fight bots is with technology. There are multiple bot detection tools (both free & paid). The most famous free option is Cloudflare that most people use for page performance optimization. While they offer a lot of value for free, any bot that is somewhat sophisticated will make it through the Cloudflare filters. 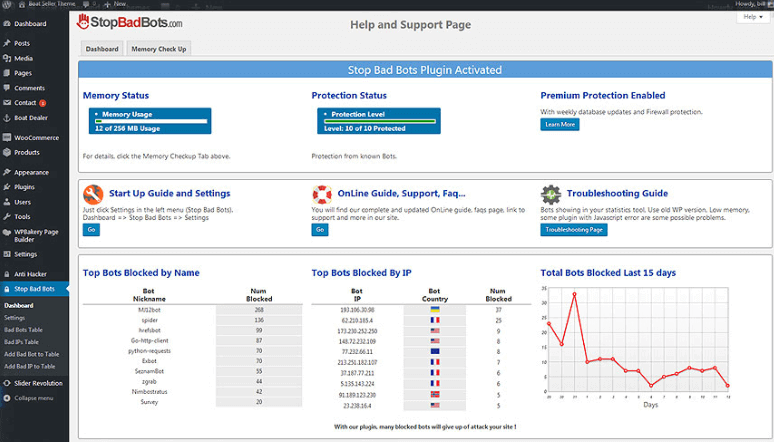 If you want to get serious about detecting invalid traffic, then you should check out Impact Radius or StopBadBots (Premium). StopBadBots is better for smaller publishers because Impact Radius has a minimum monthly charge of $5k. Allowing white listed services with customizable access such as Google, Yahoo, Bing. Automatically update your disallowed bots while searching the Bad Bots List. Determining the maximum number of allowed clicks per user over specified time range. Preventing accidental clicks on your own (or team members) by removing your IP. Disable all ads feature when noticing large increases in unresloved clicks. There really isn’t much that you can do if your account has been banned due to invalid traffic. Google takes this very seriously and will block any Adsense accounts under your name, and even if you decide to start a new legal entity with no connection to your last account, it can be a little tricky to get away with successfully starting a new AdSense account. So what is the best answer of what to do when your account is banned? Never have it happen in the first place 😉 Make sure that you fully understand the other conditions outlined within the Adsense Terms & Conditions and follow our guide above to prevent it. If it still happens, then do your best to appeal but 99%+ chance you will not be successful. If that’s the case, you should pick up the pieces and monetize your site with non-Google demand sources. We would recommend implementing header bidding to start. Besides invalid traffic, your Adsense could get banned from mature content, duplicate content, encourage readers to click on ads, linking to illegal or copyrighted content and many other obscure ways. Bottom line, don’t try to trick the Google algorithms. It’s just not worth it because you’ll eventually get caught. If your site has been banned, you can use a Adsense Banned Checker or look into one of our other posts on the best Adsense Alternatives. Google is very good at figuring out which impressions and clicks on Adsense are human versus bots but they are not very good at how they handle this. As a publisher it is up to you to look after your own interests and be aware of any invalid traffic activities. You may never be able to stop all invalid traffic, but can dramatically reduce the risk. As mentioned above, I absolutely do not condone in any way these actions on how to get your competitor banned, but wanted to show you how easy and accessible this is within the blackhat communities. If you have any comments, questions or concerns, please comment below and I will respond in detail.